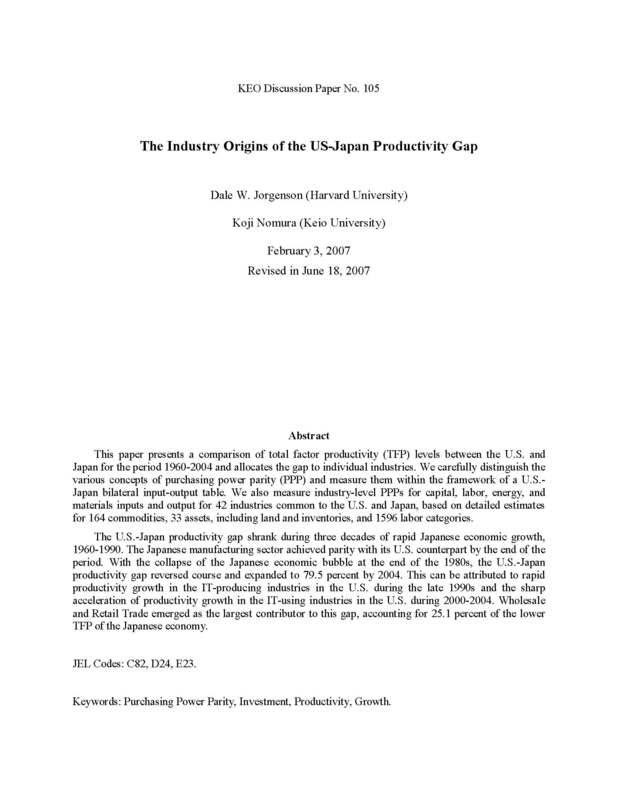 This paper presents a comparison of total factor productivity (TFP) levels between the U.S. and Japan for the period 1960-2004 and allocates the gap to individual industries. We carefully distinguish the various concepts of purchasing power parity (PPP) and measure them within the framework of a U.S.-Japan bilateral input-output table. We also measure industry-level PPPs for capital, labor, energy, and materials inputs and output for 42 industries common to the U.S. and Japan, based on detailed estimatesfor 164 commodities, 33 assets, including land and inventories, and 1596 labor categories. The U.S.-Japan productivity gap shrank during three decades of rapid Japanese economic growth, 1960-1990. The Japanese manufacturing sector achieved parity with its U.S. counterpart by the end of the period. With the collapse of the Japanese economic bubble at the end of the 1980s, the U.S.-Japan productivity gap reversed course and expanded to 79.5 percent by 2004. This can be attributed to rapid productivity growth in the IT-producing industries in the U.S. during the late 1990s and the sharp acceleration of productivity growth in the IT-using industries in the U.S. during 2000-2004. Wholesale and Retail Trade emerged as the largest contributor to this gap, accounting for 25.1 percent of the lower TFP of the Japanese economy.